Purchase 4 Select Goodyear Tires and Receive a Prepaid MasterCard valuing up to $100 via Manufacturer Mail in Rebate. Valid through 12/31/18. Entries must be submitted by 1/31/19. Click here to download rebate form for terms and conditions. It is easy to forget to maintain your vehicle's lights. As weather changes, the quality of these easily looked-over car parts becomes more and more important. Regularly change your bulbs as needed so you can See and be Safe. 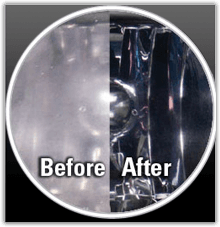 If the clarity of your headlights is not up to par, consider restoring those clouded, hazy headlights to crystal clear with our See and Be Safe 3M Headlight Restoration Service Package. Not Sure What you Need? Make an appointment and we'll talk about it. Headlights are an item on our car that we might not realize are malfunctioning. We recommend walking around your vehicle with the lights on to check for any burnt out headlight, brake, fog and hi-beam bulbs and replace them immediately. For improved visibility, it’s also a good idea to have a headlight restoration performed. This service package will restore dull, cloudy, yellowed headlights. Pep Boys carries a full line of both replacement and high performance bulbs for your car, truck or SUV. Learn our tips and tricks to make sure your headlight replacement runs smoothly. Here at Pep Boys, we want you to feel safe when you're on the road. Learn here about headlight warning signs. Light Emitting Diodes are the most efficient electrically powered light in the market. Learn how to buy them here at Pep Boys.